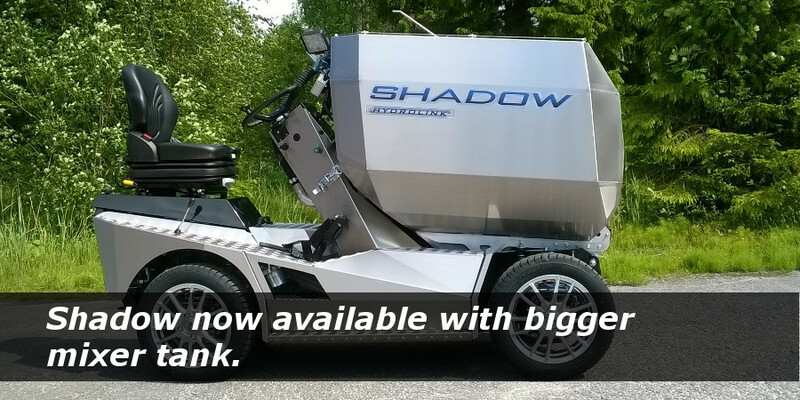 - Shadow now available with bigger mixer tank (775 liter). The best is now better! Kaj Carlson made the first engine driven feeder Gigantic in 1964. 2014 the Carlson Family celebrated 50 years of non-interrupted success. Scanblack, Silver- and Blackcross produced today represent top of the art and therefore we are primary forced to beat ourselves. 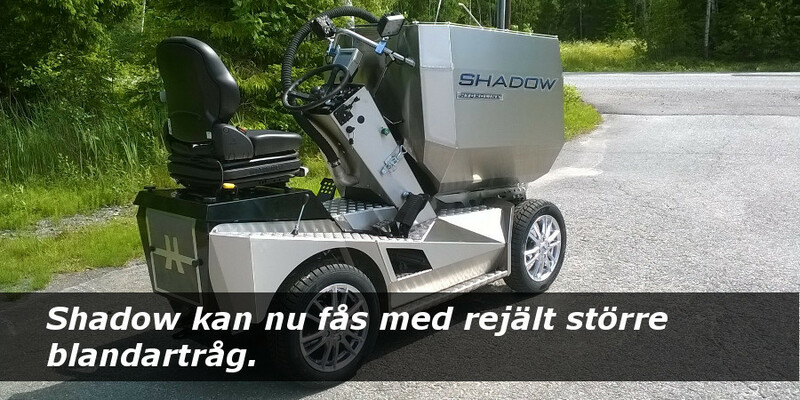 This is done by introducing Hydrolink Shadow to our dedicated and becoming customers. We fine-tune components to the uppermost performance with the lowest power take off possible. Our customer service participate where the work take place and so helps us to design future classics. Oil and engine cooler side by side to prevent clogging. Hydraulically driven for maximum cooling efficiency. The fan can be rotated in the other direction to blow away hair and dust from the airways. The entire power from the fourth cylinder is transmitted to the wheels and feeding pump since no additional losses has been applied. 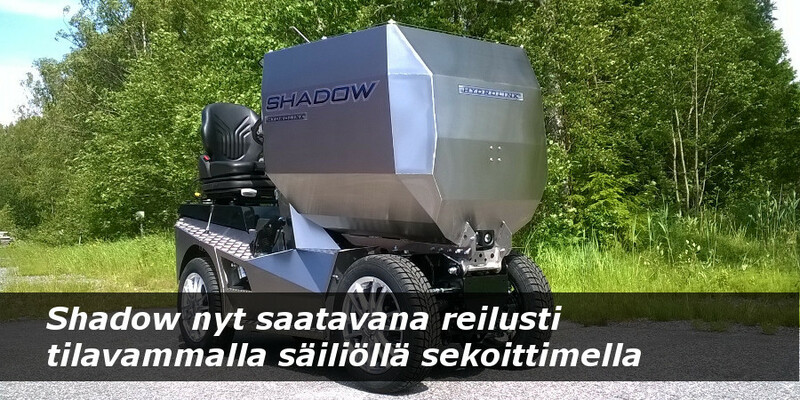 To be able to use our well proven chasis, wheel support system and foodtank, the Shadow has used ScanBlack as a ruler. 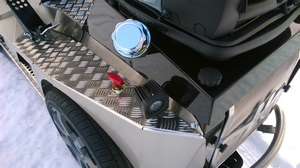 Only the total length has increased slightly due to the rear mounted radiator. The sitting comfort is the same as on Platinum. The hydraulic pump has 66% more capacity for both driving and feeding. Combined by bigger hydraulic motors it gives 0-14 kmh in low speed and 0-27 kmh in high speed. The speed is selected by an electric valve operated by a toggle switch situated in the drivers seat. Due to bigger hydraulic pump and motor the feeding pump speed is 6% higher and torque 56% higher than in previous models. The torque increase is milling harder parts easier and the risk for interruptions are smaller. A switch operated by right foot has been placed to the left of the feeding pedal. With this you rapidly and shortly change the feeding pump direction enabling suction to discharge the post pressure in the feeding hose. 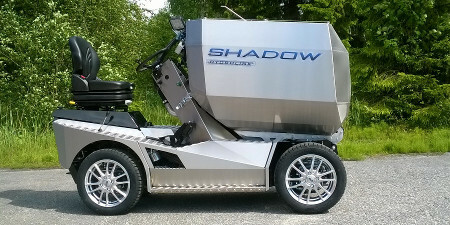 Both pump and motor for the mixer is bigger in Shadow. Torque 25% and speed 28%. The mixer is designed to need less power and thus contributes to more efficient feeding. 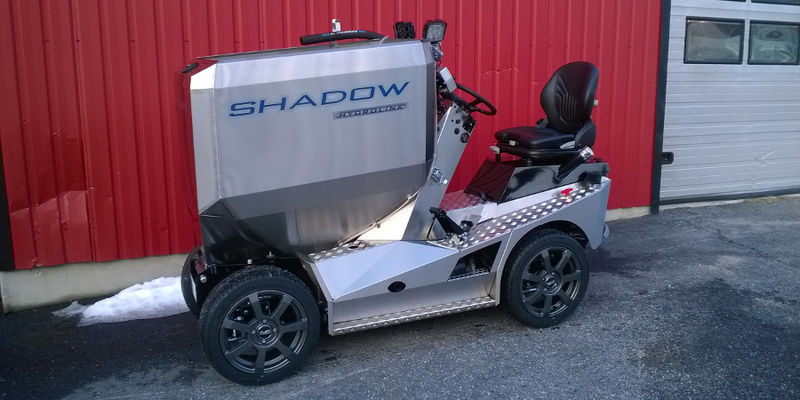 To achieve better floating needed for the increased speed Shadow can be equipped with 195 mm wide tyres on 15'' aluminium rims. The standard version has got 155 mm tyres on 14'' rims. 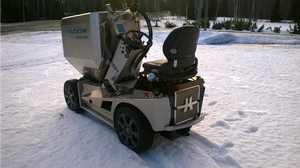 When the cooler was moved to the rear the fuel tank has been placed under the driver´s seat. 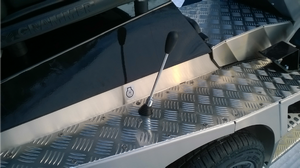 The whole package is resting on rubber cushions to reduce vibration even more. 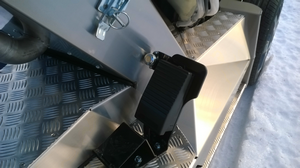 Those who reverse longer distances has now received a simple drive pedal extension to decrease fatique. This device doesn´t affect on other things and it can easily be applied to older machines as well. 2 separate foot steps are intergrated in the side covers. The well proven rails on the food tank always comes as standard. 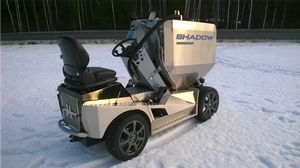 Shadow belongs to a growing number of machines made to withstand environments where other surface treatment systems over time loses its fight against corrosion. If pride is not an issue, others will surely follow. Once again we managed to beat ourselves by installing all above mentioned without changing the well proven base. Only the fourth cylinder raises net weight. The components we use are well known to us from the models we have been manufacturing during the last 20 years. ''When it works, don´t fix it'' is our motto.